It took an article in the LA Times to get me into St. Mary’s Mexican Food. I live less that two miles from them. I drive directly past them at least twice per week. I drive within 1/2 mile of them twice a day. I’ve lived in Tucson for nearly 19 years – why’d it take so long? 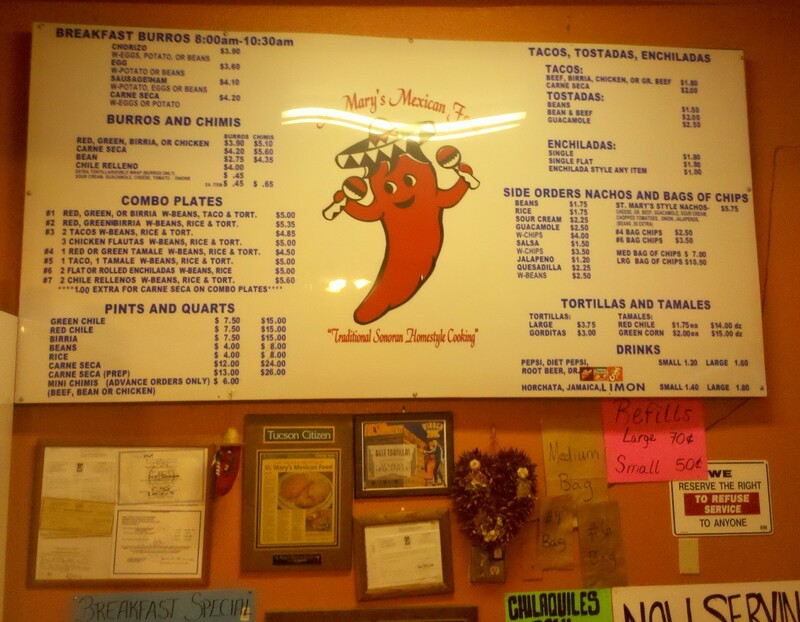 I’ve eaten at many small Mexican restaurants down that stretch of St. Mary’s, but never there. Whatever the reason, I’ve been missing out. The good news is that I don’t have to any more. I almost missed the turn into the parking lot, then almost hit the motorcycle parked in a place that wasn’t really a parking spot. I began to wonder if those were signs that I shouldn’t go in. After deciding it had more to do with my less-than-cat-like reflexes, I went in. The setup is simple. There’s a menu hanging above the counter. Read it, step to the counter, say what you want, and you’re done. I went with the combination #1 – I mean, it’s #1 for a reason, right? That combo came with your choice of red chile, green chile, or birria, beans, a taco, and a tortilla. I’m wild about birria, but was feeling more like red chile tonight. My sytrofoam box came out within a couple of minutes and I was out the door. Oh, and had I ordered my dinner to eat there, it still would have come in the styrofoam box. I got to the car, dropped the box on the seat next to me and started to back out. Then I stopped. I was overtaken by the smell of the red chile. I popped open the box and dipped my finger into the sauce. It was thick and smoky, with a light back-of-the-throat heat. I knew right then that I’d be writing about this dinner. 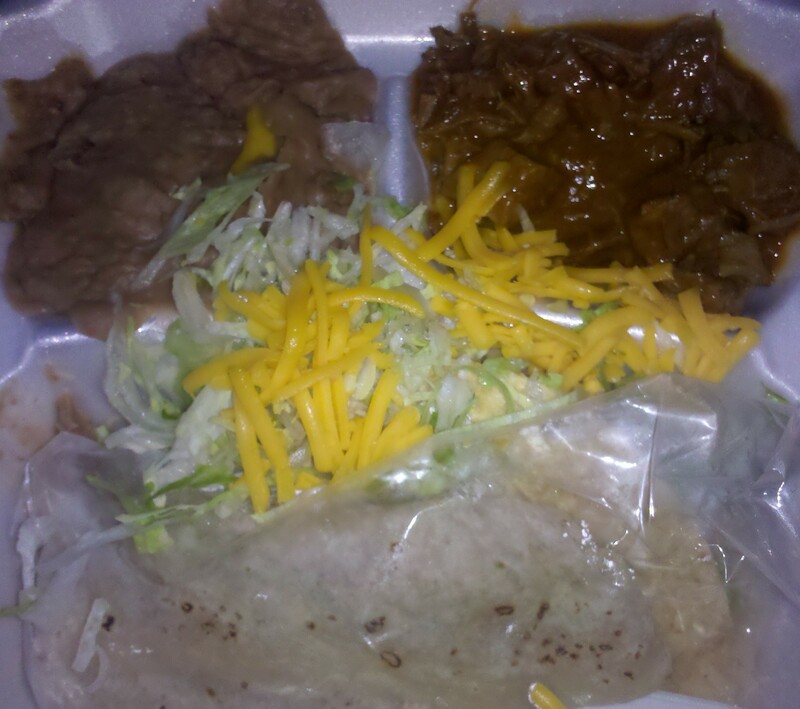 The food - red chile, refried beans, taco, & tortilla. The taco is hiding under the cheese and lettuce. and just fall apart, but it was firm and slightly elastic. Those things are hand-stretched, and there’s not anything to compare them to. The refried beans were great: thick and dense, with – again – sort of a smoky flavor to them. The beef in the chile was lean but meltingly tender. A little scoop of beans with a little scoop of the red chile in a little piece of tortilla was incredible. Go get some. Get some now. But wait, there was still a taco in that box! I’d almost forgotten about it in my rapt attention to the other parts of my dinner. It had a hard corn shell, but not the kind that would either a) disintegrate with the slightest amount of liquid or b) shatter into 1000 pieces at the first bite. The texture was a perfect compliment to the moist shredded beef inside. Holy cow. This was a good meal. Strike that – a great meal. So, my friends, don’t make my mistake. Don’t wait 19 years to visit St. Mary’s Mexican Food. Go soon and go often. I may just see you there. And did I mention that my total for dinner – including tax – was $5? Yeah, $5.00. 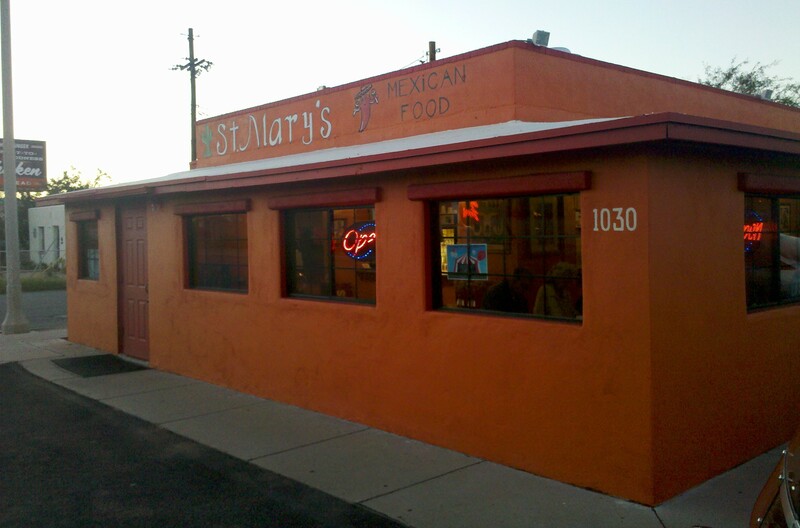 St. Mary’s Mexican Food is located at 1030 W. St. Mary’s Road, just a couple of blocks west of I-10. ← What are your favorite places to eat in Tucson? i’ll have to try it sometime soon. Sorry to have that effect, but I’m pretty sure that’s about the nicest thing you can say to a food blogger! Kevin – you made me hungry and I just came back from lunch. I love that place. I’ve been going there for a few years now and try to make it there at least once a month. Their tortillas are awesome. Try breakfast (I like good ‘ol potato and egg w/ salsa, ‘double wrapped). Don’t miss the tres leches cake.